Despite this blog’s ‘title’, “The Diva in Down”, I *try* not to be a ‘diva’ on expedition. I generally *try* and stay away from worries about ‘hair and makeup’, brightly coloured nail polish, conversations about designer handbags, and the latest fashion tips offered by Maire-Claire magazine… So, it was a bit ‘out of character’ (ah hem) to cut my ‘team coffee’ short yesterday because I had to get a massage.... Needless to say, this raised a few eyebrows as I’d protested earlier that day that even though I was sporting bright blue sparkly nail polish (which matched my jacket and my shoes) that I wasn’t ‘high maintenance’. I could almost hear the eyes roll as my team mates chuckled quietly as I scurried down for my hour of indulgence. I must admit, I’m not a ‘massage person’ but Sushila Shakya, one of the owners of one of the main and historical buildings on the ‘main street’ (including Cafe Danphe and Namche Cyber Cafe and Restaurant) in central Namche had given me a tour of the boutique massage and sauna facilities on a previous expedition and encouraged me to give it a try. I’d never had the time to do so but found myself today feeling ‘adventurous’ and treating myself following the long hot slog up Namche Hill…! 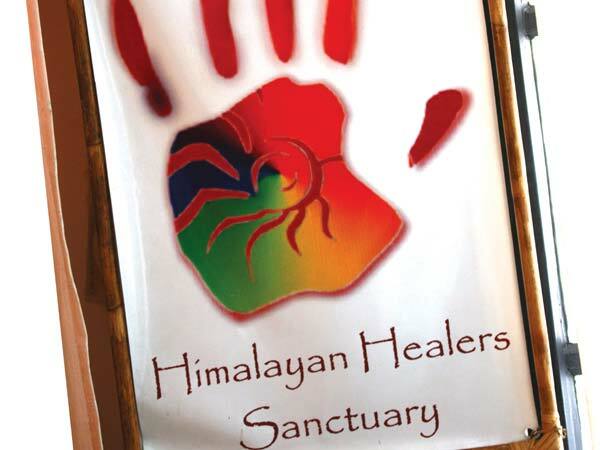 The spa is part of the Himalayan Healers social enterprise which was established in Nepal about 10 years ago. It was set up for trauma victims in Nepal – primarily women who have been raped, abused, orphaned and/or trafficked – to allow them to go through a process of rehabilitation while learning healing and massage in the safe environment of a healing arts school in Kathmandu. Since its humble beginnings with two massage beds, Himalayan Healers now has branches throughout Nepal in Kathmandu, Pokhra and Namche in many botique hotels. Since its inception, at Himalayan Healers, the message is clear: everyone is equal. The training is open to anyone with a profound need, and the organisation’s success is determined by the healing of its students. For the students, the personal healing begins on the first day of training. The students train for five hours a day, six days a week. The training slowly progresses from a simple “feet treat” to a full body massage over the 14-week course. But what makes the programme unique is that all of the students have faced profound trauma. From Ashmita, who was raped and left for dead, to Pooja, who was rescued after being trafficked across the Indian border, each student suppresses many emotions related to these events, and as the weeks progress, these emotions begin to come to the surface as part of their rehabilitation. Himalayan Healers work on a social entrepreneurial micro-credit scheme. A good faith deposit based on the student’s economic background, which can range from Rs. 1 upward, is paid by the student towards the Rs. 25,000 fee (circ 250 USD). The student is responsible to repay the fee after they’ve secured employment and their lives have stabilised following the training. The recovered fees pay for subsequent batches of students, helping to make the organisation self-sustaining. Each batch ranges from eight to 10 students, and the school does not take on any student without being able to guarantee employment following the completion of the programme. A majority of the students start by working in one of the five Himalayan Healers Spa Boutique locations and several have chosen to take positions at world-renowned spas abroad. For others, the confidence regained through the training has inspired them to pursue other interests. Like Satish, who is now attending medical school. The massage – complete with heated stones – was absolutely amazing and a ‘must do’ for anyone passing through Namche either going to or coming back from an expedition or trek. I thoroughly enjoyed the hour of indulgence and it felt fantastic to be supporting such an excellent cause. I would highly recommend that anyone passing through Nepal visit one of the Himalayan Healers facilities..!